There was no hard sell needed during Monday’s soft opening of D’Amici’s Downtown Lynn Café on Sutton Street, where word of mouth resulted in brisk business. “We were quiet for breakfast, which we expected, but we’re picking up for lunch,” said Joseph Torretta. Torretta, along with his wife, Sarah, split time between greeting customers and working behind the scenes during what was the launch of their fourth bakery. The pair also own D’Amici’s on Eastern Avenue and two additional bakeries in Melrose and Wakefield. Torretta said it is the pending launch of yet a fifth bakery in Reading, however, that served as the impetus for the Sutton Street store. “We couldn’t keep up with the production,” he said. 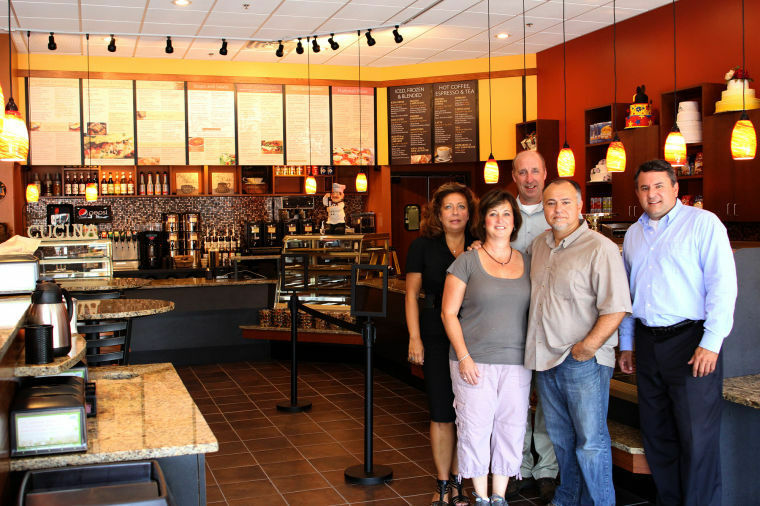 Inside the new D’Amici’s Downtown Lynn Café on Sutton Street are, back from left, Maryjane Smalley and James Cowdell of the Lynn Economic Development and Industrial Corp.; and front from left, owners Sarah Torretta and Joeseph Torretta, and Lynn Community Development Director James Marsh. Up front the cafe with its warm brown walls has a cozy coffeehouse feel. Three comfy arm chairs face the front window and small tables line the sides of the room. Torretta said he can seat 25 but has room to add or subtract tables and chairs if needed. High on the wall behind the counter are large, soft-colored menu boards. Torretta described the menu as leaning more toward a dessert breakfast with pancakes, French toast and plenty of coffee drinks. But there are also plenty of savory items on the menu from eggs Florentine, huevos rancheros, omelets and frittatas to breakfast sandwiches, lunch sandwiches, salads and eventually flatbread pizzas. It is, however, first and foremost a bakery and its wares from champagne cookies and anisette toast to mini éclairs, creme brulee and three different kinds of cheesecake plus slices of ricotta pie, are all there tempting the public from a long glass display case. Dinners to go, sandwich platters and whole cakes are also available. In the café kitchen Mario Ferrer, with help from Lety Hernandez, both from Lynn, runs the show but beyond their workspace lies an even larger operation, the commissary. Torretta said the commissary, a wide open expanse that will soon be filled with ovens, worktables and rolling racks, will be where cakes and other goodies are created for each of his bakeries. The far side of the room, separated by freezers, is a slightly smaller climate-controlled area that will be used for cake decorating. On the other side of the café are what will be D’Amici’s corporate offices, which Torretta joked will be a big step up from the closet they had previously used for an office. There will also be a conference room where he can meet with brides and other prospective catering customers. Torretta was referring to the Economic Development and Industrial Corporation. “We wanted them here,” said EDIC Executive Director James Cowdell. To entice the Torrettas to open downtown EDIC also offered them a TIF or tax incremental financing. The TIF gives the owners a tax break on the money they are investing in the Sutton Street property. Cowdell said he remembers standing in the bakery getting wet when it was the gutted former High Grade Shade and Screen Company. On Monday morning it was raining off and on again but this time visitors were dry. Customers drifted in from the courthouse, City Hall, Lynn Community Health Center and other destinations nearly everyone welcomed D’Amici employees and told them how happy they were to see the coffee shop open. One customer offering such compliments was Robert Rossetti, who is getting ready to open an Italian restaurant next door. The D’Amici’s Sutton Street cafe is open Monday through Friday 7 a.m. to 6 p.m., 7 a.m. to 4 p.m. on Saturday and 7 a.m. to 2 p.m. on Sunday, and the Eastern Avenue bakery will remain open as always. It is not closing.